It is amazing how much Tristan grew in just one month. 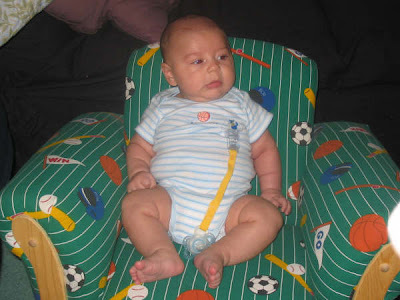 This is a picture of him in a mini rocker chair my mother gave him. He was one month old at this point. But just one month later and just look at him! These next few pictures were taken sometime between one month and two months old. I love this one of him poking his chubby, little cheek. He had already shown his dimples by this point, too. Clearly a trait he got from mommy. I'm not sure what he's thinking here, but he looks puzzled. Or perhaps, worried. The picture angle, though, makes his nose look flatter and almost pig-like. But he's still so darn cute. Now, when you have a baby and they have rolls, you gotta take a snapshot of 'em. Just look at Tristan's arms and belly! He's my little buddha boy. He definitely chubbed out fast, too. He's momma's growing boy. 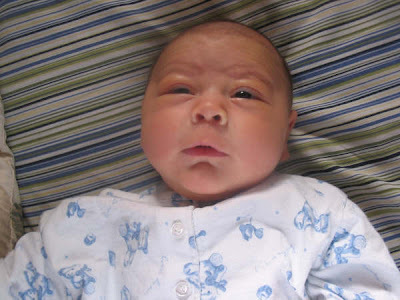 Tristan grew so fast that he was out of newborns and 0-3 month clothes in a jiffy. I still have outfits he never wore. He kept up that rate of growth for a while and topped the charts in both weight and height.